Collectible toys seem to be all the rage right now. There are tons of brands that make toys that encourage you to buy more so you can collect them all. The one I want to tell you about today are called Jigglydoos. Disclosure: I received some Jigglydoos in exchange for this post. Contains affiliate links. 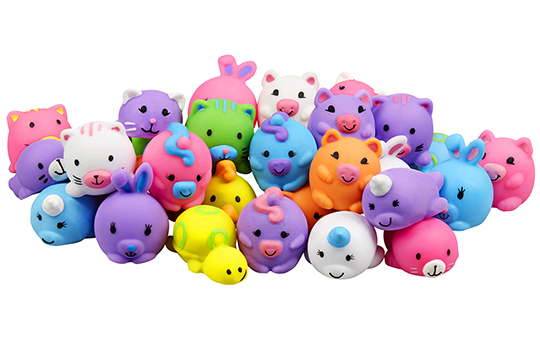 These cute little animals are almost like stress balls but a lot squishier. You can squish them as much as you want – they can take it! They love to jiggle and wiggle and they come in lots of different colours and animals. They come in 5 packs like this one (Amazon only) or you can get packs of two or this special lounge set which comes with one Jigglydoo, a couch and chair and two little accessories. Please note these are very small and since they squish, are a choking hazard so they are for ages 4+ only. Your child can collect them and play with them in any way they choose. I know my daughter likes to play with small toys like this in the toy house she has. There is also a play set (Amazon only) you can buy if you want somewhere for them to be played with. With the exception of the Amazon only ones you can get Jigglydoos at Walmart, Target, ToysRUs and other stores that sell toys.